The GHD Tail Comb is perfect for backcombing, sectioning hair for blow-drying and precision styling. 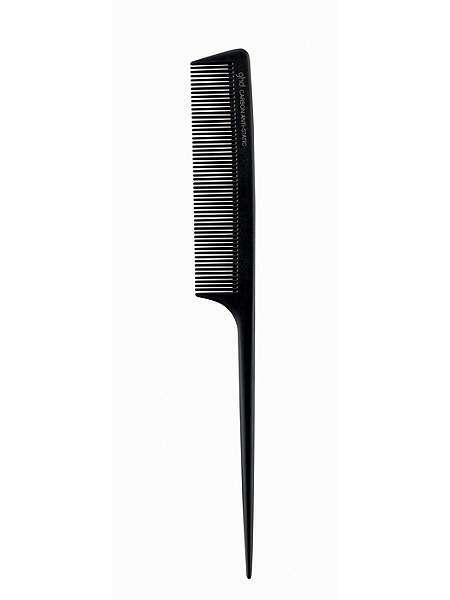 The fine toothed design and anti-static properties make simple work out of complicated up dos, whilst the longer length comb handle is ideal for tucking in rogue hairs for a polished finish. For damage-free backcombing (thats also easy to brush out), take a small section of hair and hold it away from the head. Place the comb in the section a few centimetres away from the root. Push the comb down the hair, against the direction of growth, in two short strokes, stopping short of the roots. For the third stroke, push back right to the roots. Continue with this three-stroke method on every section you need to backcomb. Use the tail end, not the teeth, to create the most accurate sections in your hair when styling.